GRAND PRAIRIE, Texas - Stealth Cam, the leader in scouting camera innovation introduces the new UNIT OPS with Black IR and TRIAD Technology. As scouting cameras continue to evolve, users are demanding more enhanced features from their cameras. The UNIT OPS scouting camera delivers the ultimate in versatility by equipping this camera with their exclusive TRIAD technology which incorporates three technologies; video, still imagery and time lapse into one complete package. The video setting is capable of 5 – 240 seconds with audio clarity. The three resolution still imagery offers an 8MP, 3MP or 1.3MP setting with the Time Lapse function. The 54 "black" infra-red emitters make this camera truly "STEALTH". The 38 "Black" IR emitters reach out to 50 ft and captures wildlife activity without spooking with this "no glow" feature. The UNIT OPS has an IR 38/30 control switch enables the user to adjust the light output to specific scouting scenarios where more or less light intensity may be needed. The UNIT OPS can record in either 15 or 30 second increments. The UNIT OPS features the Burse Mode that captures 1-9 images per triggering with a 1-59 second or 1-59 minute recover time out. 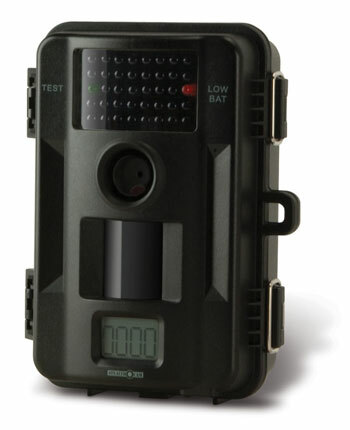 The external LCD status display lets the user quickly identify and select the modes of operation. The time/date/moon phase and temperature stamp helps identify the exact wildlife habits for the hunter. The UNIT OPS has a 2x or 4x digital zoom setting and incorporates an SD card slot that accepts up to a 16GB memory card.